Merck & Co’s cancer drug Keytruda has been granted a priority review so that the immunotherapy medicine can be used in conjunction with chemotherapy to improve survival rates for untreated lung cancer. The US Food and Drug Administration (FDA) will make its decision within six months rather than the standard 10 months. 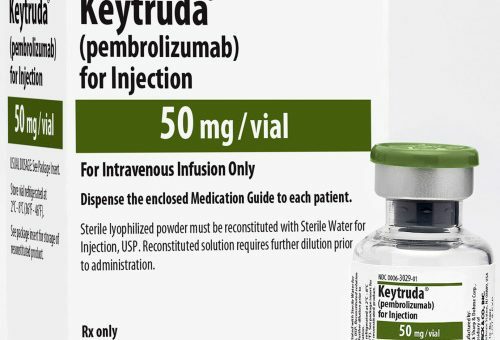 The filing for Keytruda (pembrolizumab), seeks approval in combination with chemotherapy drug pemetrexed and platinum chemotherapy (carboplatin or cisplatin) as a first-line treatment for patients with metastatic nonsquamous non-small cell lung cancer (NSCLC). Immunotherapy works by harnessing the immune system to fight cancer, rather than attacking the cancer directly. Drugs such as Keytruda are known as ‘checkpoint inhibitors’. These monoclonal antibodies work by preventing cancer from pushing a ‘stop button’ on immune cells, thereby spurring on the body’s natural immune system. Merck is focusing heavily on treatments for lung cancer and is pushing forward studies with Keytruda in combination with other treatments and as monotherapy. The programme, which involves around 9,000 patients across 15 Merck-sponsored clinical studies, is evaluating the drug across multiple settings and stages of the disease. Lung cancer, which forms in the tissues of the lungs, usually within cells lining the air passages, is the leading cause of cancer death worldwide. NSCLC is the most prevalent type of lung cancer and is most common among people who have smoked. Opdivo, the rival drug from the Bristol Myers-Squibb stable, has to date not performed as well as Keytruda when used in combination as a first-line lung cancer treatment. Also, in 2016, Opdivo failed as a monotherapy and did not slow down the progression of advanced lung cancer in a clinical trial, which had compared it with conventional chemotherapy.